Cubed design channels dirt away from the paint! Looking for a good quality foam car wash sponge at an economical price? The Lake Country Foam Wash Sponge is for you. This thick, ultra porous wash sponge is cross-cut with channels to pull dirt away from the paint as you wash your car. The amazingly porous foam holds a tremendous amount of soapy water to lubricate and protect the paint. The Lake Country Foam Wash Sponge is smart, simple, and effective. If you find yourself going through a lot of car wash sponges, it’s time to upgrade to the Lake Country Foam Wash Sponge, a.k.a. Big Blue. Lake Country’s foam compositions are known for their quality and durability and this wash sponge is no exception. The unique design of the Lake Country Foam Wash Sponge sets it apart from other wash sponges. 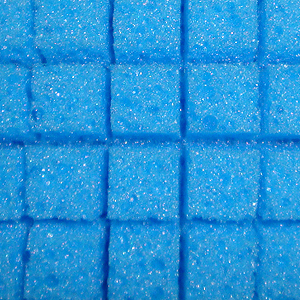 The foam is cut into ¼ inch cubes on each side. The cubes work two ways: They create channels where dirt and grime can migrate away from the paint, and the cubes provide a more effective cleaning surface than an ordinary flat sponge. The Lake Country Foam Wash Sponge will quickly become a staple in your detailing arsenal. The durable, porous foam and smart, cubed design make it an invaluable wash tool for those Saturday morning details or for frequent professional use.